READY, SET …GO! The launch of a new project occurs in order to fill a need or when a client wants to test an idea or develop a budget and to explore territory untouched by others. The entrepreneur forces that are creating new paradigms and new industries make for an exciting time to be at work. Architecture is changing as work, living and play places require new ways to engage and solve new issues for the users. I am currently involved with a project that was first built in the 1950s. 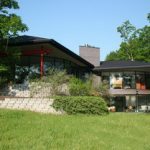 This mid-century modern aesthetic has become popular again with the millennium-aged populations in many parts of the country. My professors were practicing in this era, so that same design approach is laced through my work. The style’s origin is from pre-World War II Germany and the Scandinavian region and even Asia. It’s American branding is most recognized in the work of Frank Lloyd Wright. But there are many peppered through the St Louis region and the USA. They are treasured more than ever, as a new generation of buyers take interest in the “non-traditional” style. The image depicts a favorite residential project that I executed in the mid-1990s. 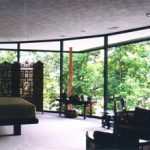 The major design elements include large expanses of full to ceiling glass, low roofline, with large overhangs, horizontal masonry, open floor plan and quality material selections.The recent interest in mid-century modern projects and design is growing. Something that I applaud.